I’ve helped with this issue a couple of times now so thought it would be ideal to blog. Basically when running a remote SQL instance, and adding in the Reporting Services Point, the Reporting Services server instance is empty. 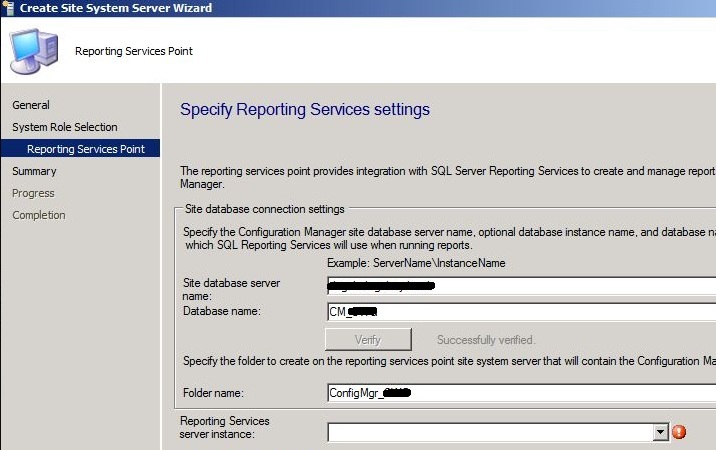 To resolve the problem ensure that the Reporting Services site role is installed on the SQL server and not the SCCM server. In Administration workspace choose Site Configuration>Servers and Site System Roles. Right click the SQL server and choose Add Site System Roles. Continue the wizard and add the Reporting Services Point. What if your SCCM server is on one box, SQL is on another and SSRS is on a 3rd? Sorry can you clarify what you mean here? Is this a restart issue or a population issue? I am well and truly stuck, any advise at this point would be massively appreciated. Paul, Thanks for getting back to me. Yes I had already configured Reporting services, this is why I reached out. After reading someone elses comment that MS hadn’t seen this issue before, I decided to rebuild back to Server 2008 to see if that fixes the issue, if it does, I will work from there to resolve. If I get a fix for this issue, I’ll post here to help everyone out.